We spent this weekend at a funeral. Kid’s funerals are emotional affairs, although it has been a very long road for this child and his family so the funeral was also coloured more by a sense of peace than injustice. It’s the first time I’ve been involved in a funeral in Argentina, so part of me was dedicated to observing with outsider’s eyes to figure out what was happening and where I should put myself within that. From first impressions I am impressed by the way Argentina handles death. The theme here is “accompanying the body”, from the moment of death till the burial, which happens quite quickly, usually within 24 hours. The body is laid out in an open coffin in a place of the family’s choosing, sometimes a funeral parlour, sometimes the person’s own home, and friends and family come and go. At an appointed time the coffin is sealed and a vehicle comes to lead the procession to the cemetery, where the burial takes place following a simple ceremony, and the grave is filled in. While I’m sure that the practice of “accompanying the body” owes its origins to folk-catholicism and the cult of the dead, the net effect seems generally to be a good one. Adults sit quietly with the parents, stand around and chat, send out for biscuits and hand them round. Children look, prod, ask child-like questions and, satisfied with the answers, go back to their game. The coffin in the middle is clearly the focal point, yet without receiving a huge amount of attention. Although Paul, in his letter to the Corinthians, refers to death as the last enemy to be destroyed, for now at least, dying is a natural consequence of living, and it seems to me that Argentina has found a healthy way of responding honestly to this reality. It’s been a bitty couple of weeks. We’ve been busily chasing our tails, and it’s been too hot to exist, let alone to indulge in gratuitous tail-chasing. Dates have been fixed and air-tickets purchased for our trip to Europe later this year. Some things have to be organised in advance, even in Argentina. Now we’re trying to leave some things in place for when we return here in August. This is proving to be slightly complicated, not least because we have two different job offers to come back to. One is a situation filled with potential; and an equally abundant range of problems. The other may not be so controversial… or it might just be that we don’t know what the issues are yet. Since they are four hundred kilometres apart, the one sure thing is that we won’t be accepting both of them. Meanwhile, normal life rolls along. I was preaching last Sunday, so I spent most of my free time musing thorny questions, like why Jesus seems to have set out deliberately to antagonise the Pharisees, and what is the likelihood that we would have recognised him had we been in their shoes. 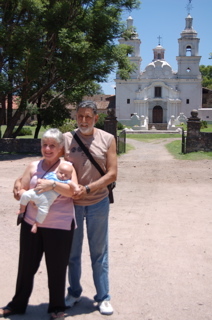 We took a day out with our friends Ana and Oscar, and went touristing to the Jesuit estancia of Santa Catalina, an isolated village in the province (photos above). 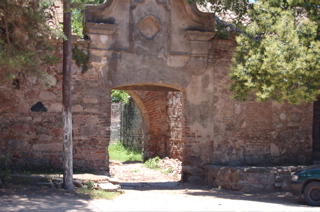 Oscar’s family is from Santa Catalina, and the place looks as though it hasn’t changed a great deal since the time of the Jesuits, complete with some of Oscar’s relatives still working in the village. Joni is discovering that the world is full of yummy things to eat other than milk and his fingers. So far his favourites include ice-cream and his socks. Strangely, the weaning section in the baby book doesn’t mention either of those. The piglet in the pushchair or the lamb on the fire? We went to San Francisco for new year, a small city about 200 kms from here. Our church has been supporting a small congregation in San Francisco, and we have become good friends with one of the families who we like to visit when we can. The plan for New Year was to roast a piglet, so the day before, the animal was collected from the neighbour’s freezer. When it was unwrapped however, it turned out to be a lamb. So we debated briefly about putting an apple into Joni’s mouth, but decided to stick with the lamb. 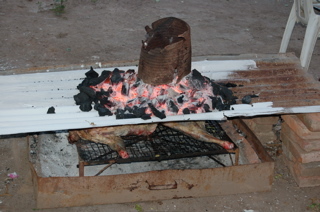 Here we see one of several methods of cooking a lamb. The main fire is built on the top, and then as the embers are produced, they are shoveled underneath, so the meat cooks slowly from both sides. Joni who had the narrow escape, is just up to the six kilo mark, so he would have made a fine substitute. 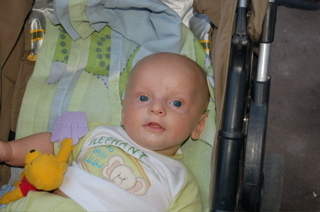 This means he has more than doubled his birth-weight in three months. Martin has had serious words with him about not making a habit of it.